saskatoon, yxe, puerto vallarta, pvr, mexico, flight deals, westjet and north america. 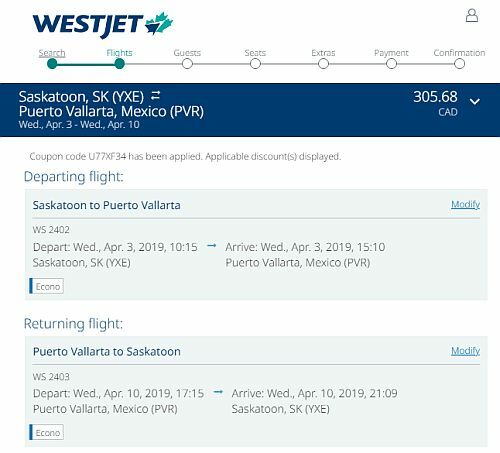 One Response to "Saskatoon to Puerto Vallarta, Mexico - $305 to $359 CAD roundtrip | non-stop flights"
Carrie Underwood is my favourite US contry singer. She is young, beautiful and charming female in her 30s. Her voice takes me away from all troubles of this world so I can enjoy my life and listen songs created by her voice. Now the singer is on a Cry Pretty 360 Tour started in May of 2019. The concerts scheduled for this year, up to the last day of October. Ticket prices are moderate and available for all men and women with different income. If you love contry music, then you must visit at least one of her concert. All tour dates are available at the Carrie Underwood tour Sioux Falls. Open the website and make yourself familiar with all Carrie Underwood concerts in 2019!